Taking ibuprofen counteracts the benefits of taking aspirin to prevent heart disease, increasing the risk of fatal illness, researchers have found. Researchers from the University of Dundee have found those taking both aspirin and ibuprofen have a 75% increased risk of dying from cardiovascular disease compared to those just taking aspirin. They also had a doubling of risk of dying from any cause, the study published in The Lancet found. Aspirin is known to cut the risk of heart attacks and strokes, and is often given to patients with a history of cardiovascular disease. Aspirin reduces the risk of having another stroke or heart attack because it makes blood-clotting cells called platelets less "sticky" and therefore less likely to clot and block blood vessels. Previous research has shown ibuprofen prevents the aspirin from stopping the clotting. Lead researcher Professor Tom MacDonald said: "It would be as though they had never taken aspirin." Professor MacDonald and his team followed 7,100 patients from Tayside, Scotland, treated for cardiovascular disease who were prescribed a low dose of aspirin after they were discharged from hospital. They then looked at deaths amongst those taking aspirin and those taking prescribed aspirin and ibuprofen. Researchers also looked at death rates amongst those taking aspirin and a different pain-relief, or Non-Steroidal Anti-Inflammatory (NSAID), drug. They found that the 187 taking both aspirin and ibuprofen had a doubled risk of dying from any cause and a 75% increased risk of dying from cardiovascular disease, compared to those just taking aspirin. 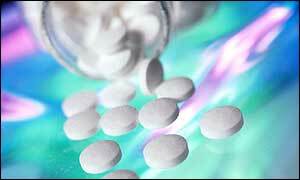 Those taking aspirin and another NSAID were also at no increased risk. Professor MacDonald said: "Although our findings are not conclusive, they do support the hypothesis that ibuprofen may reduce the benefits of aspirin in people with cardiovascular disease. "Perhaps it would be prudent that such patients took an alternative pain-killer at least until this issue is further clarified. "Furthermore, we also know that aspirin and ibuprofen taken together increases the risk of bleeding from stomach ulcers. "So this combination may not only reduce the benefits of aspirin, but may also increase the risks of side effects." But writing in The Lancet, Garret FitzGerald from the Wellcome Trust Centre for Human Genetics at the University of Oxford said other factors, such as smoking, could have affected the results of the study. Belinda Linden, of the British Heart Foundation, said: "There is some evidence that long term use of ibuprofen may reduce the cardioprotective effect of aspirin." She said the authors of the Dundee study admitted it was small and had some limitations. But she added: "It would be useful for health professionals to discuss the choices open to patients when informing them about the benefits or limitations of their drugs, and the questions that still need further research before any definite change in practice is suggested." The research is published in the Lancet.